A 76-year-old man who has spent his entire life living in the Sa Dec Flour Village, a famous craft neighborhood in the Mekong Delta province of Dong Thap, sat down with Tuoi Tre (Youth) newspaper to discuss the reasons behind his devotion to bringing prosperity to the village. Nguyen Van Nuong, aka Tu Nuong, credits his success to his stubborn nature – a trait which he says has given him the confidence and fearlessness to weather the challenges life has thrown at him over the years. When the American war ended in 1975, thousands of small businesses were forced to close as part of the new government’s efforts to control the economy – and Tu Nuong’s flour-making business was no exception. The government’s decree was a heavy blow to Tu Nuong’s family. They had spent generations producing flour and it was their only source of income. Because he was operating outside the law, Tu Nuong often found himself face-to-face with government officials who would seize his flour-milling machine. Still, he refused to give in and would scrape the money together for a new one by borrowing from friends and family. 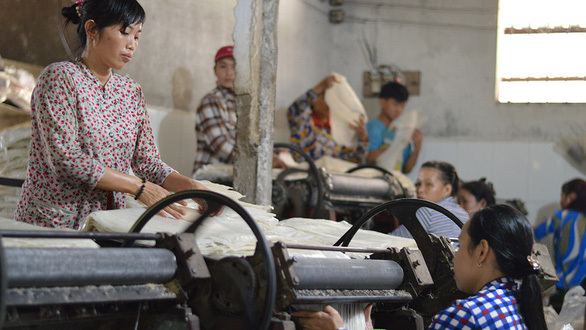 Aside from the legal dangers, producing flour also posed several health risks for Tu Nuong. Rotten finger nails from constantly working with water, back pain, and accidents involving the milling machine are just a few of the common risks associated with milling flour. “These are also the main reasons why the number of local flour producers has dramatically dropped over the years,” Tu Nuong said. One of the most time-consuming and physically-demanding aspects of flour production used to be beating the mixture of milled rice and water in order to dehydrate the mixture and create flour. However, Tu Nuong was able to invent a machine to help with the dewatering process and increase his productivity by two to three times. The Sa Dec Flour Village is currently the main supplier for a huge chunk of Vietnam’s food industry, especially the rice noodle sector. The village also exports rice flour to many countries around the world, including Japan, South Korea, and several in Europe. Now, hoping to jump on the zero-waste bandwagon, Tu Nuong hopes to follow in the footsteps of another local company which produces straws made of rice flour so as to erase the need for plastic straws. Though Sa Dec is a city historically known for flour-making, today there are only a few hundred households left who are still involved in the profession. Keeping the flour-making tradition alive is particularly important to Tu Nuong, as he believes Sa Dec flour has a unique taste. With flour producing traditionally being passed on to both daughters and sons for many generations, Tu Nuong inherited his skills and milling tools when he got married and started his own family. The flour business has been in his family ever since. Over the course of his career, he has managed to gain the trust of local business families throughout the Sa Dec Flour Village and currently serves as the head of the Sa Dec Flour Club, with 63 local producers as members. According to Tu Nuong, the club helps members, most of whom are also neighbors, build better business relationships with one another, centered on honesty and the desire to share experiences and help themselves improve productivity. Thanks to the club, the business families stopped thinking only about themselves and the village was able to avoid individuals that constantly cut prices, forcing others to do so as well. 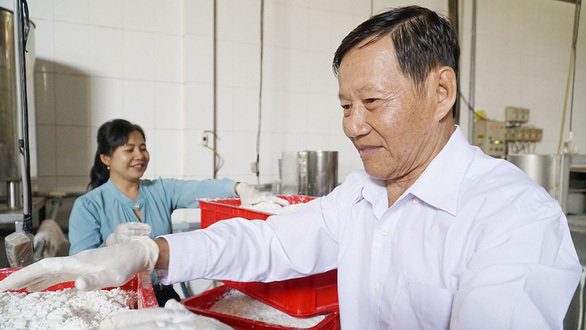 “Tu Nuong instructed many members of the club to make flour good enough for export while also providing suggestions on developing other flour products,” Le Nhut Truong, one of the Sa Dec Flour Club members, said. The 76-year-old businessman even suggested going a step further by creating a fund that allows local businesses to take interest-free loans in order to branch out. To attract tourists, Tu Nuong has established a food corner which sells various traditional dishes cooked by the local families.